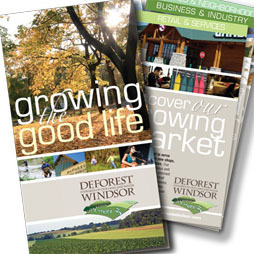 DeForest-Windsor community marketing | Vandewalle & Associates, Inc. In 2010 the Village of DeForest, Wisconsin and its neighboring communities of Windsor and Vienna sought to establish a common area identity to better compete for new business, retail and workforce. The group hired Vandewalle & Associates to develop a fresh and unified positioning for the area, and an identity framework that would allow each of the communities to maintain individual identities within the context of the shared area. Vandewalle & Associates weighed existing research, new survey and focus group findings to create a marketing blueprint based on desired targets, area goals, and key community assets.